Yogi's Great Escape is a side-scrolling platform game where your mission is to save Jellystone Park from its impending closure. It consists of six levels which take place in Jellystone Park, The Forest, Wild West, Mumbo Jumbo Marsh, The Funfair and New York City. Most of these are your standard platforming fare where you need to make tricky jumps and avoid a wide range of enemies. However, the themed stages do help to keep things interesting. There are many objects scattered around and although they aren't necessary to complete the level collecting all of them will add a Special Bonus to your point total. The final level sees you piloting a hot air balloon and it's probably the best stage in the game - in fact, it reminds me of Up, Up and Away (1983, Atari 8-bit) as you need to carefully manoeuvre your vehicle while dodging incoming birds and instant death traps. The main problem with this port of Yogi's Great Escape is that it doesn't include anything that wasn't already seen on the various 8-bit computer versions. It would have been nice to have slightly longer levels or more stages to make this a true 16-bit game; instead it only has six very short stages and the whole game can be beaten in around ten minutes if you're good at platformers. Even the A.I. hasn't been reworked and enemies still frequently walk off the edge of a platform to their death! The graphics feature some nice parallax scrolling and the backgrounds do a good job of conveying the different themed levels. There's only one music track that's repeated in each level and although it's decent it doesn't fit in this style of game at all! 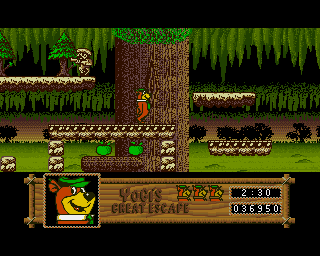 Yogi's Great Escape is a fun platform game but it's simply too short and doesn't take advantage of what the Amiga can do. It's certainly a lot smoother than it's 8-bit counterparts but it failed to include any extra content that it desperately needed to help set it apart. Random trivia: This port was coded by Gary Antcliffe who also programmed the Amiga versions of Bomb Fusion (1989) and Blazing Thunder (1991).